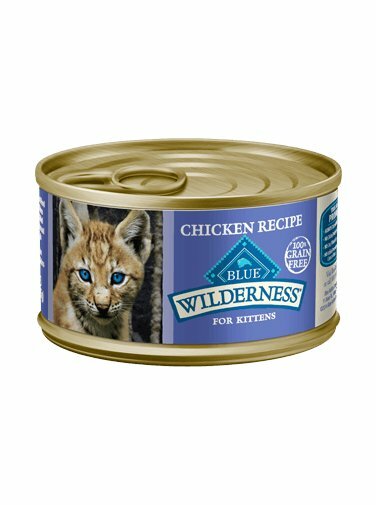 Inspired by the diet of the lynx, BLUE Wilderness Kitten Recipe is a high-protein food that will provide your kitten with a higher concentration of the chicken she loves. Plus, it’s formulated specifically to help meet the important needs of growing kittens. Chicken, Chicken Broth, Salmon Oil (source of DHA-Docosahexaenoic Acid), Potatoes, Guar Gum, Natural Flavor, Flaxseed (source of Omega 3 and 6 Fatty Acids), Potassium Chloride, Taurine, Choline Chloride, Carrageenan, Cassia Gum, Iron Amino Acid Chelate, Zinc Amino Acid Chelate, Vitamin E Supplement, Thiamine Mononitrate (Vitamin B1), Mixed Tocopherols, Copper Amino Acid Chelate, Manganese Amino Acid Chelate, Sodium Selenite, Niacin Supplement (Vitamin B3), Calcium Pantothenate (Vitamin B5), Pyridoxine Hydrochloride (Vitamin B6), Riboflavin Supplement (Vitamin B2), Vitamin A Supplement, Biotin (Vitamin B7), Potassium Iodide, Vitamin D3 Supplement, Vitamin B12 Supplement, Folic Acid (Vitamin B9).